Focused on responsibility towards people, animals and environment. Being a medium sized, globally operating enterprise, sera is aware of their responsibility towards people, animals and environment. The specialist for aquarium, pond and terrarium care thinks and acts responsibly as to be able to leave future generations an intact ecological, social and economical structure behind. The principle of sustainability is firmly positioned in all company processes – from the production via transport up to sales. Only in 2015, sera invested about five million Euro in new machinery and software on their premises in Heinsberg. The aim: to make production even more efficient and sustainable. The first was to change the packaging of the food range. The cans became considerably more compact and thus more resource saving. The contents, however, remained the same. sera uses only natural ingredients from renewable sources for their high quality food. The company is strictly against fish meal from food fish. sera thus clearly positions themselves against species extinction and overfishing the oceans. Another bonus point concerning environmental protection: Due to short supply chains, only a few days pass between manufacturing the food in Heinsberg and their arrival in pet stores. This ensures maximum freshness and keeps the burden for the environment as low as possible. Sustainability has been being lived and breathed for decades by sera – in the truest sense of the word: Since the 1990s, the company has had several large photovoltaic systems on the roofs of the production halls. These produce a maximum performance of approximately 500 kWp in total. During the last three years, the photovoltaic systems alone allowed saving more than 1,100 tons of CO2. Furthermore, a block heat power plant is in operation on the premises of the company, which sera operates together with a regional energy provider. The produced electricity could cover the requirements of 400 single family houses. It is partially being used on-site. The rest goes to different purchasers industrial estate Heinsberg/Oberbruch. sera uses the heat energy occurring during electricity production for the production as well as for heating the halls. It is thus produced on-site and does not have to be transported a long way, which would mean considerable losses. Further examples for sustainability being lived and breathed: Both the administration building and the training, break and social rooms are heated with geothermal energy and lighted in an energy saving way. Corresponding domotics additionally avoids unnecessary energy consumption. The air-conditioning or heating switches off automatically in case of opened windows. The light automatically goes out in rooms where no people are staying. 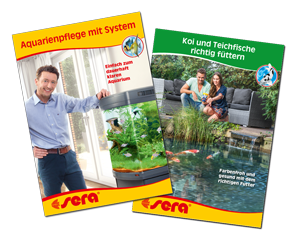 sera develops sustainable product solutions for the aquarium, terrarium and pond in the own laboratory of the company. The aim is to provide an appropriate living environment for fish, reptiles and plants. Maintaining a biological equilibrium is very important for this purpose. 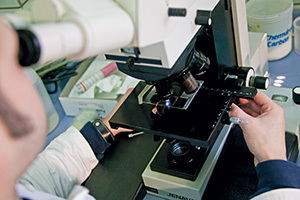 sera products are intensely being tested concerning their tolerability, efficiency and functionality. The complex recipes of the different food types are, for instance, optimized in a way that the underwater inhabitants in aquariums and ponds as well animals in terrariums are fed ideally. The food ensures healthy growth of the animals as well as best possible utilization. Food utilization, in particular, has great influence on water pollution. Low water pollution means less water changes and a healthier environment for the underwater inhabitants. Introducing the new food types of the “sera Nature” range in May 2018 was another important step considering sustainability. Besides not using dyes and colorants, the Nature food types are characterized by using only natural ingredients. This, for the first time, includes insect meal which serves as a sustainable protein source: in addition to fish meal from sustainable fishery, insect meal is another high quality protein source and very easily digestible for the fish. The excellent amino acid profile furthermore indicates a high biological value, i.e. a high percentage of the protein taken up can be converted into own body protein. 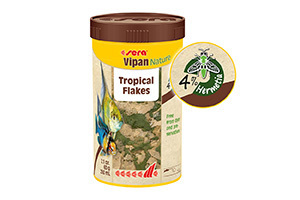 The new food types Vipan Nature and Goldy Nature, for instance, contain 4% and 5%, respectively. 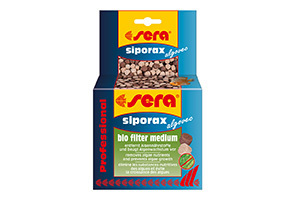 The high quality sera filter materials such as sera siporax algovec Professional are another example for sustainable products. The carrier material is almost entirely made of recycled glass. The high performance filter medium consists of the carrier medium and nutrient utilizing bacteria in a stable permanent form. The bacteria are applied to the carrier material. Upon contact with water they take up their work and multiplication. They remove algae nutrients – mainly phosphate – and permanently ensure biologically healthy, crystal clear aquarium water. There is thus no need to apply chemicals whatsoever for algae combat. This also supports environmental protection. Conclusion: Sustainability is a concern of the heart for sera. “We can lastingly protect the natural living basis of humans, animals and environment and permanently keep the joy of the aquarium, pond and terrarium hobby only by acting responsibly”, owner Josef Ravnak puts it.